Thursday May 12 1910 Will started to help me work and a man came to buy Bess & Lady. That hindered us and it was late before we got it done. He went to town in the afternoon and I baked a cake made custard and did the ironing before supper time. I worked the butter after supper and did other work. It has been a hard days work for me and my left lung has hurt me terribly. Weather cool and strong wind blowing We have been married [24?] years today. Friday May 13 1910 Will went out east of town and brought the team back he sold yesterday. I swept and cleaned the lower part of the house. Lizzie & her Father went down on the 8.12 car and [Steven?] Jr brought her out in the afternoon. We visited until bed-time. 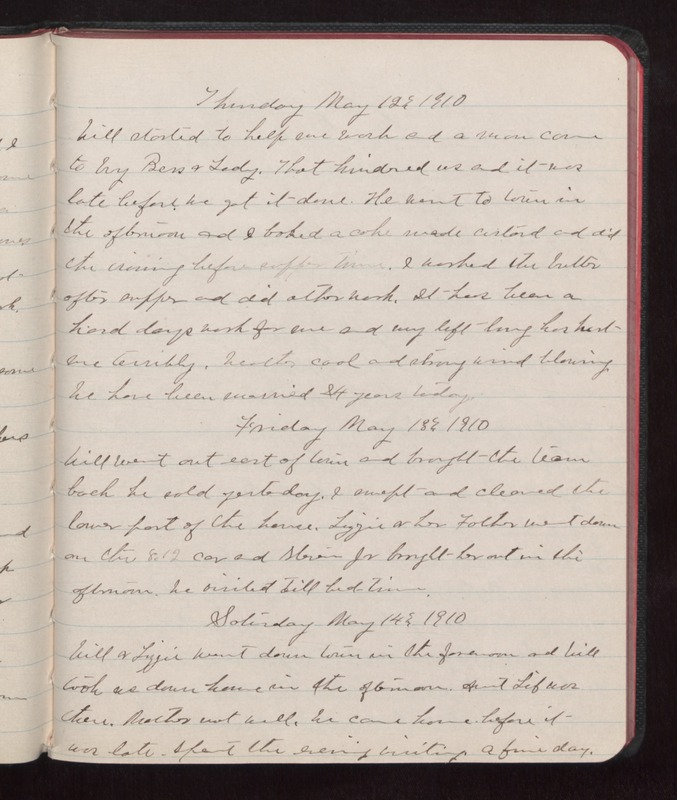 Saturday May 14 1910 Will & Lizzie went down town in the forenoon and Will took us down home in the afternoon. Aunt Lib was there. Mother not well. We came home before it was late. Spent the evening visiting. A fine day.